When you go to evaluate an insurance claim, it is easy to be overwhelmed with the immensity and the emotion of the situation. Wildfires shift and move quickly and often without warning, and no matter how prepared an individual may have been, this represents a frightening, unexpected event. Given this, it is incumbent upon the adjuster to be professional, courteous and patient as you work through the process. While every situation is different, three factors in approaching wildfire preparedness and insurance claims can help you perform better. Fire consumes quickly, and no one is ever fully ready. A shift in the wind can send a wildfire on an entirely different path. People may have felt safe, and discovering too late that they were not can be devastating. Your job description may be to assess and evaluate a claim, but you can set yourself apart by remembering the human element. Take time to listen first, rather than diving into numbers. The rest of the claims process will go much more smoothly. 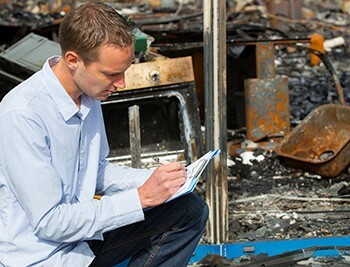 When approaching wildfire preparedness and insurance claims, you want to look for documentation first. A fireproof safe, a safe deposit box or some other off site location can hold important information. In addition, many important documents may be stored online in the cloud. Work with the insured to find any proof you can. That said, many insureds may have documentation in drawers or otherwise in property that is destroyed. Here, you may need to be creative. Proof of ownership may be found in Facebook pictures, store records or other places. Wildfire preparedness and insurance claims create a confusing, frightening process. As the adjustor, acknowledge this, but focus yourself and the insured on the process of making the insured whole. By doing this, you take the sting out of the experience for those you help and keep yourself from succumbing to the emotions of the moment.